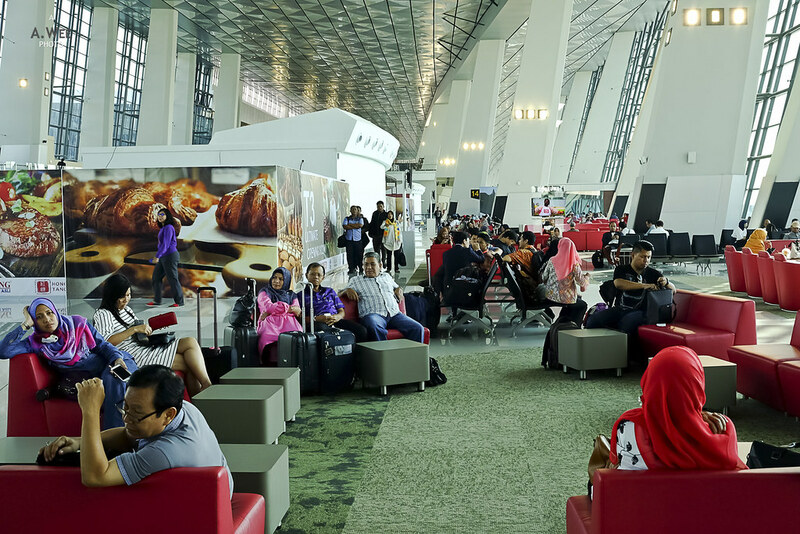 Jakarta is perhaps one of the major cities in South-East Asia that has a more or less antiquated airport terminal in its capital city. 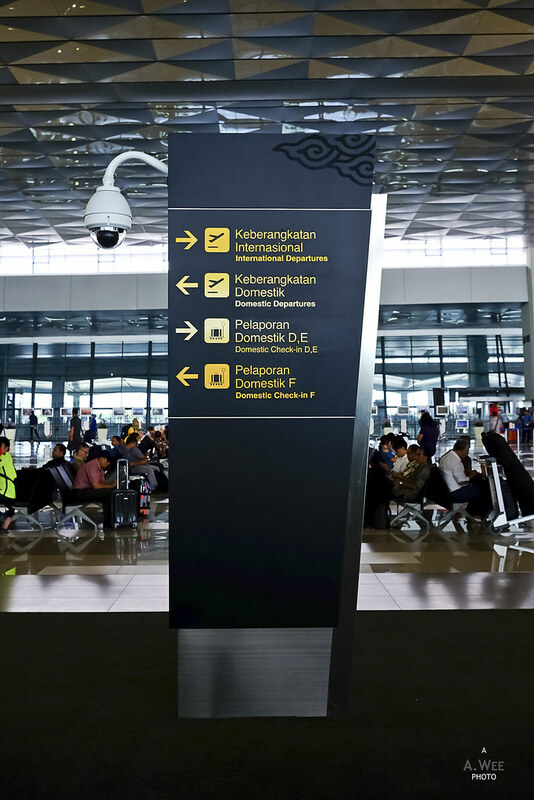 Due to years of mismanagement and lack of infrastructure funding, it was only recently that a new airport terminal opened in Jakarta’s Soekarno-Hatta International Airport – CGK. Dubbed as ‘Terminal 3 Ultimate’ to distance it from the smaller Terminal 3 built for low cost carriers, the new terminal has a modern airport architecture which is a departure from the traditional design touches that makes the Terminal 1 and 2 more charming. At the departure concourse, passengers gets dropped off on a wide walkway and they cross a bridge to get inside the main check-in counters. Like in the old Terminal 2, there is a security checkpoint before crossing into the terminal proper. Since the terminal just caters to passengers travelling domestically on Garuda Indonesia flights, it was not crowded and I never had to queue for the security screening. With the quick screening, I experienced the new Terminal for the first time and the vast ceilings and huge open space made it a better space to hang around in compared to the older terminal. Modern and shiny new finishings add a touch of glam while wood accents on the check-in counters give a little bit of warmth in the otherwise dark terminal. 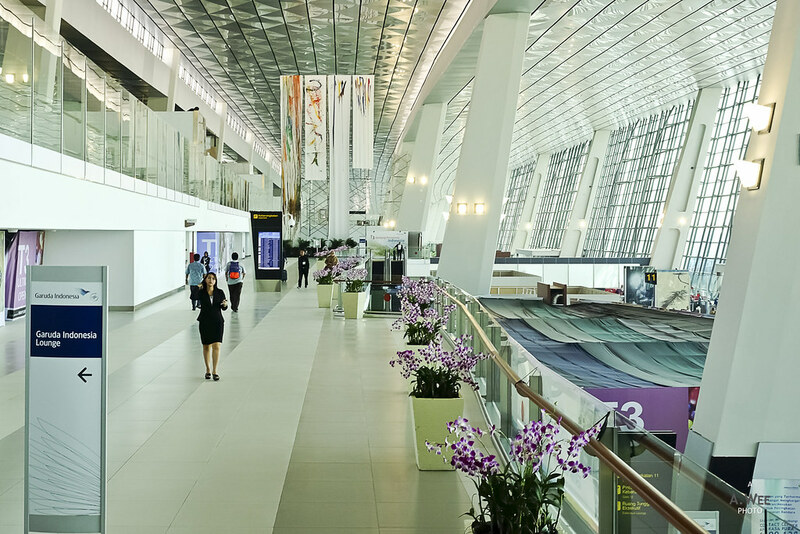 Compared to Changi Airport’s Terminal 3 or Hong Kong’s International Airport which are both bright and inviting, Jakarta’s Terminal 3 feels more like Bangkok’s Suvarnabhumi Airport. Another essential thing lacking was information. There was no large departure information boards on entrance to show where passengers should head to for check-in. In contrast to the large open spaces, the signs on the direction panels are somewhat small. As a much larger terminal, the check-in counters are certainly too far away to allow passengers to see the words on the counters. This was a classic case of misjudgement in human factors in design. 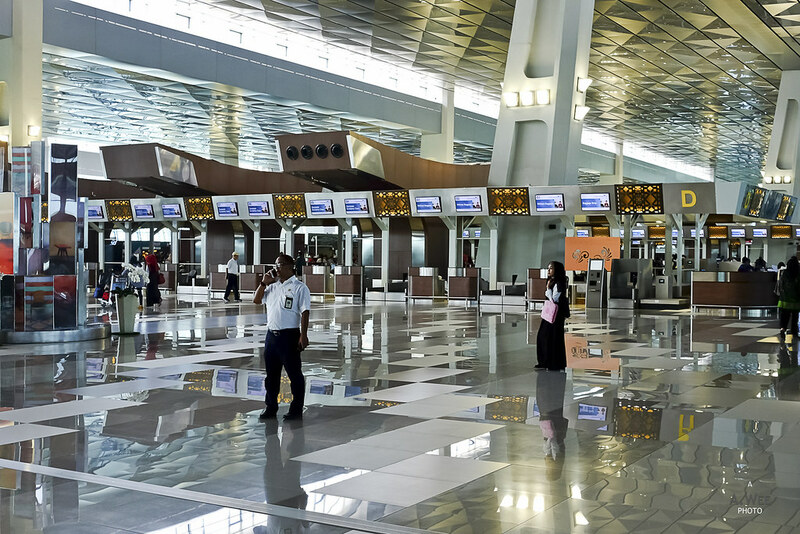 At this point in time, only one third of the terminal is actually used and passengers are directed to the sole security checkpoints before the boarding gates at the end of the terminal. That meant a lot of walking across this vast terminal. The security checkpoints was well manned and there are plenty of screening rows to ensure there was never a long queue for access to the air-side portion of the terminal. One special row was reserved for Sky Priority members which is a nice touch since the international side is expected to host all the other SkyTeam members and partners of Garuda Indonesia. With no wait at the second security screening, I was cleared into the departure waiting area in no time. 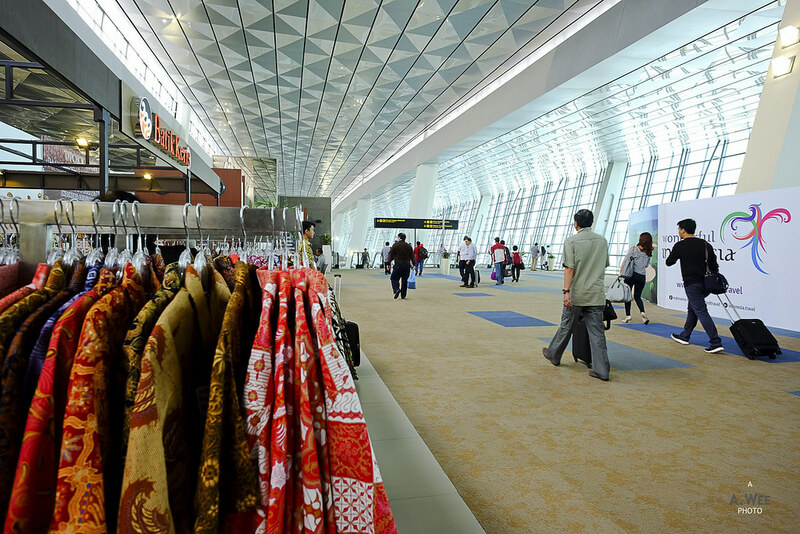 Passengers enter the terminal from the top and there are some exhibits on Indonesian crafts before a couple of temporary shops and boutiques selling snacks and Batik clothes. From there passengers take the escalators down, and there are 2 sets of escalators with one leading to the Garuda Indonesia Domestic lounge and the other leading to the main waiting gates. This site could potentially become a holding point for passengers rushing as everyone will head to these escalators and I do hope the people designing the new Terminal has other pathways leading down when the whole Terminal is fully operational. Over here on the airside of the terminal, glass panelled window creates a bright and open view out towards the main runway and the tarmac. However this creates an additional problem as it felt warm inside the terminal on a sunny day. Down the escalator, there are actually flight information displays but they are very small and easily missed by the traveller who is rushing to get to the gates. Add to the fact that gate changes are frequent, passengers could end up at the wrong gates after making a long walk and this is frustrating in such a huge terminal. While there are moving travel walkways connecting various gates of the terminal, they are placed slightly back away from the gates and some of them move under the mezzanine level. In addition, the space between the moving walkways are substantially further than what I experienced at other airports. 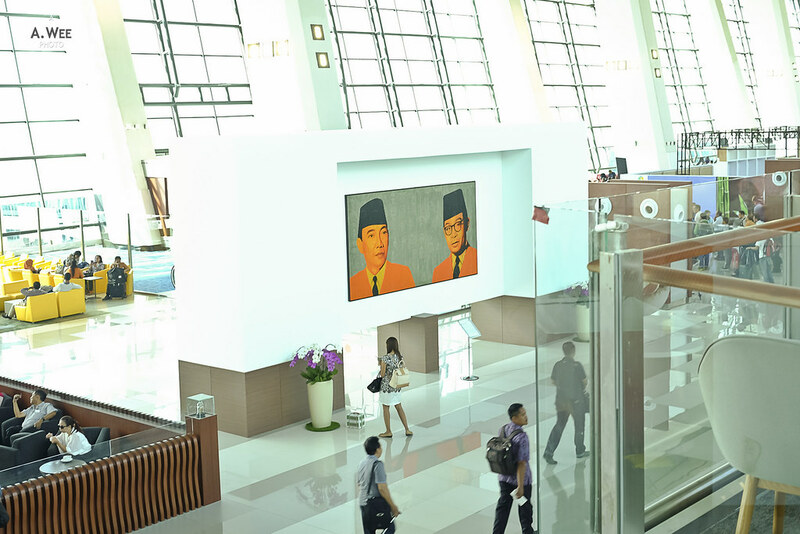 An amenity that the airport authorities did consider are strategically placed toilets and artworks placed around the terminal. However these actually blocks the gates from the moving walkways which impedes visibility and makes it difficult for passengers to see the departure from the gates while walking on the walkway. 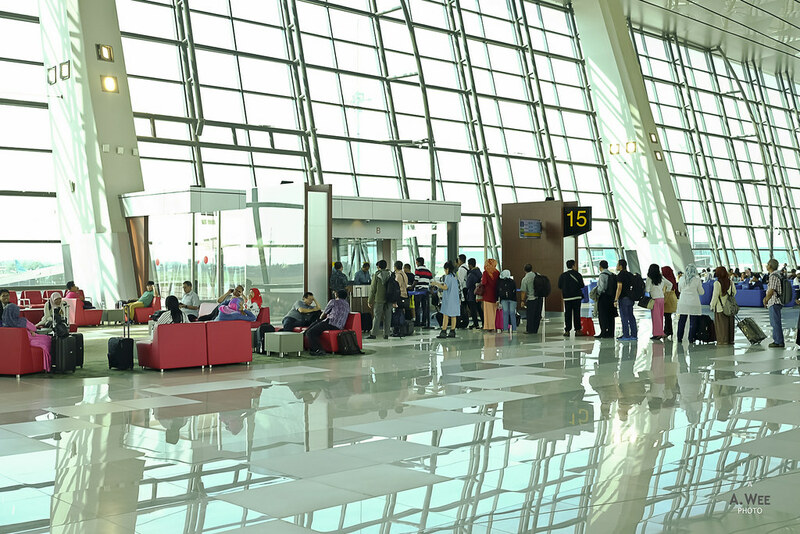 Upon reaching the right departure gates, the space is actually comfortable for waiting. There are plenty of seats and well spaced out so that it never felt uncomfortable. Shops are in the stages of opening and there seems to be a good variety too from bookstores to cafes and lounges for the weary traveller. Returning back to Jakarta, the arrival experience was not much better either. Perhaps the terminal was not fully operational, and this resulted in our plane stopping beside the jetbridge as passengers alighted by the ramp and took a short bus ride to the other end of the terminal for the long walk back to luggage claim. The walk in the bowels of the terminal was not an exhilarating experience since it was dark. 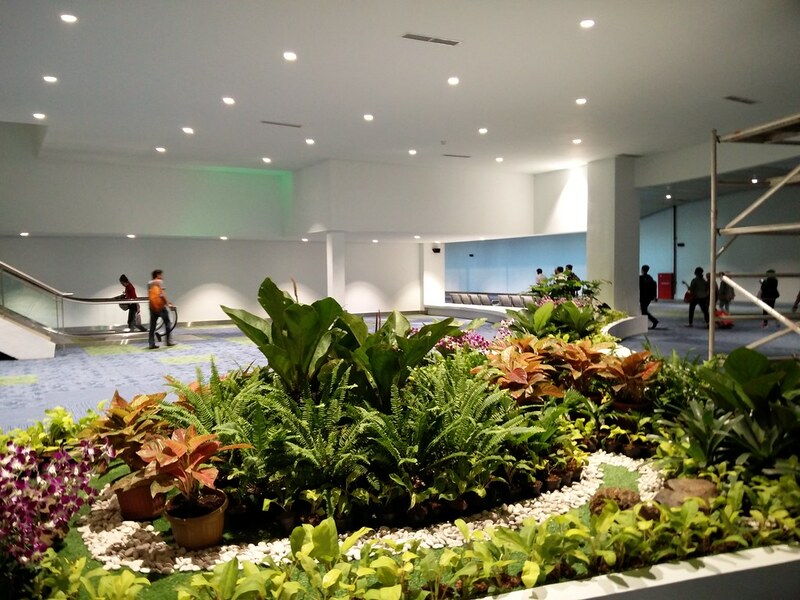 At least they took a page out of Changi’s workbook by adding a nice garden area for the transfer area that allows passengers to take the escalator back to the departure level when having an onward boarding pass. There would be transit desks in this section of the terminal in the future. 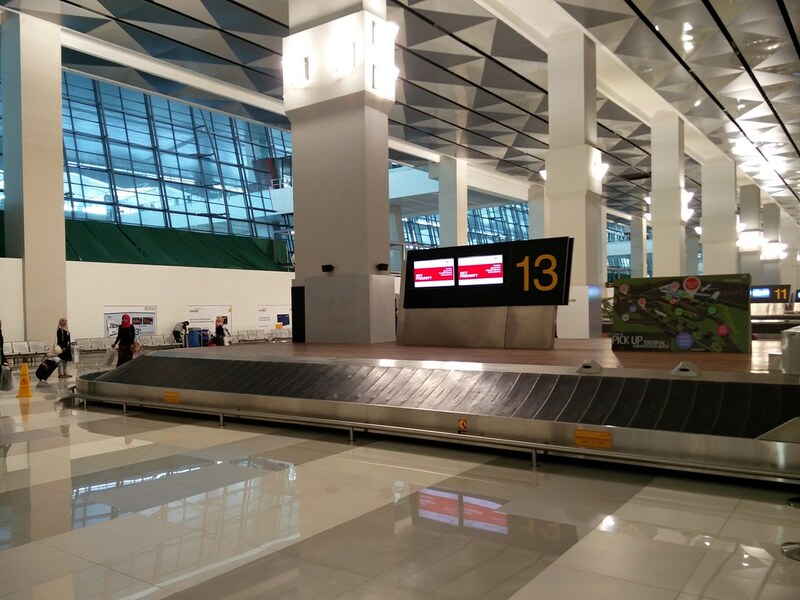 A brightly lit walkway with toilets on the side links the transfer area with the luggage claim. 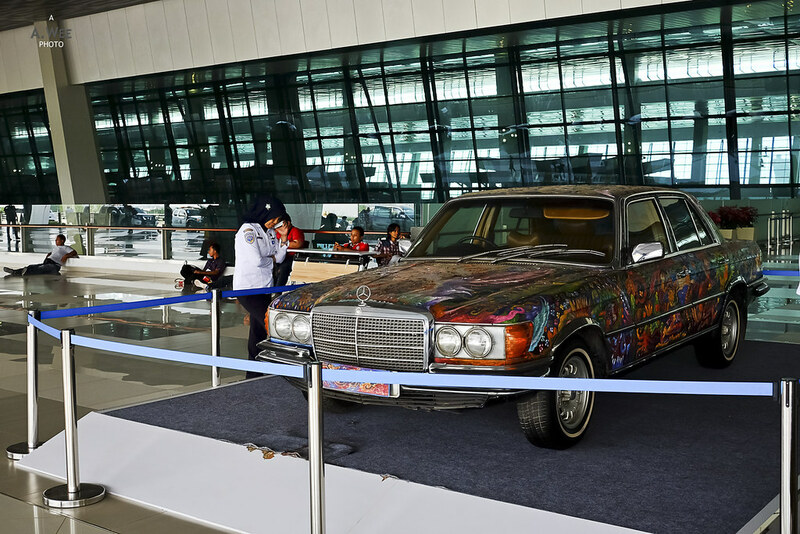 There are more art cars exhibit here to liven up the space. As for the baggage claim, there are now a lot more space around the conveyor belts which would prevent overcrowding common to Terminal 2. Though this area is still dimly lit and there just does not seem to have enough natural light here as opposed to the beautifully lit baggage claim of Changi Airport Terminal 3. The real downside to the whole arrival experience for passengers is when they are picked up by a private car. Apparently the airport authorities have not realized that some travellers get picked up by a private car since we need to walk out of the terminal into the parking garage. All private cars would then have to pay to park before they can pick up passengers, though there are some who end up picking passengers by the roadside. 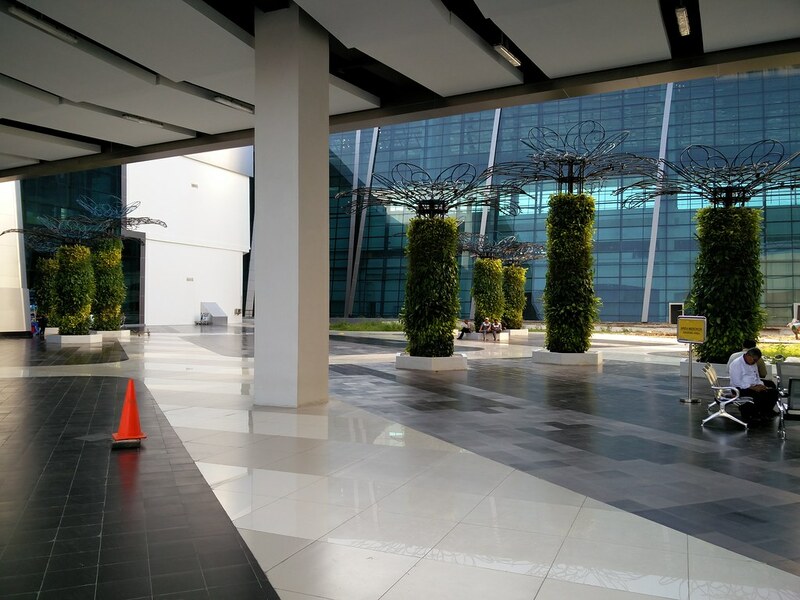 I would have expected a world-class airport terminal to have a dedicated space for private car pick-ups. 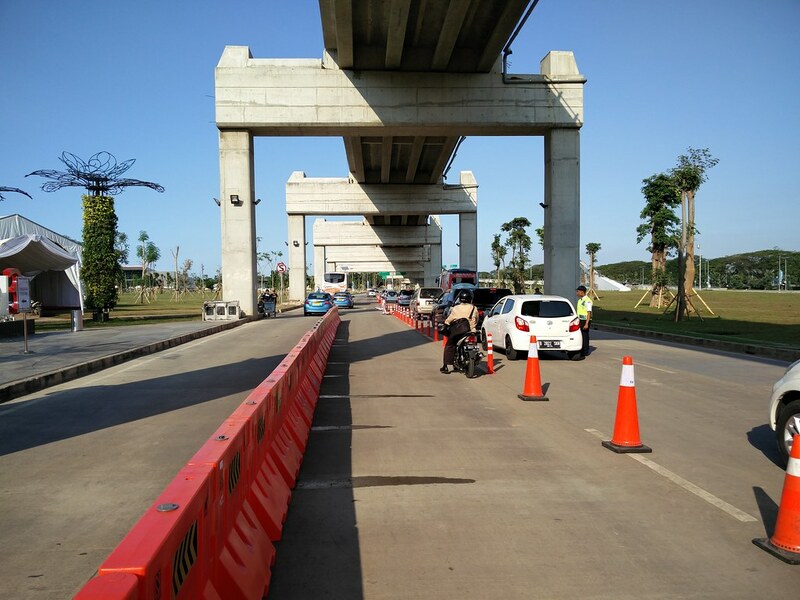 But not here in CGK Terminal 3 where the curbside is dedicated to the taxi association that have paid a fee to the airport authorities for a sticker giving them the right to pick passengers up. Talk about cronyism and inefficient bureaucracies! 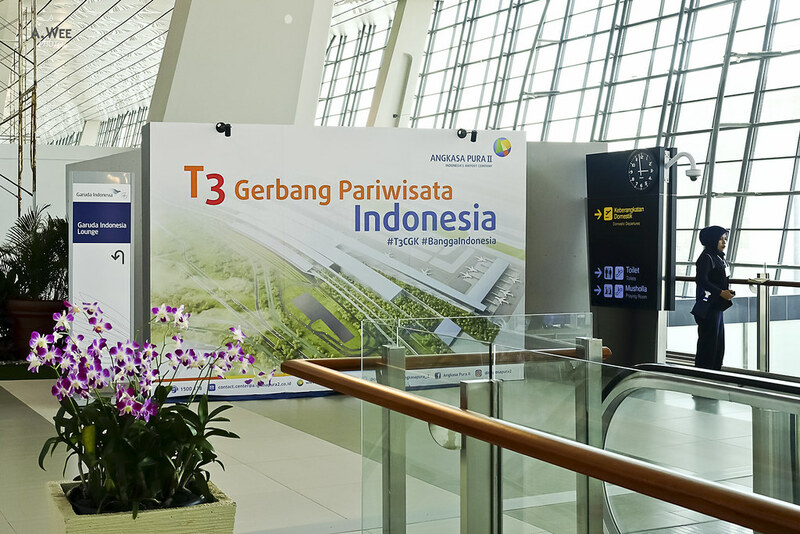 Looking at the new Terminal 3, it certainly is a huge upgrade to the existing Terminal 2, and Garuda Indonesia would certainly benefit from this new space. 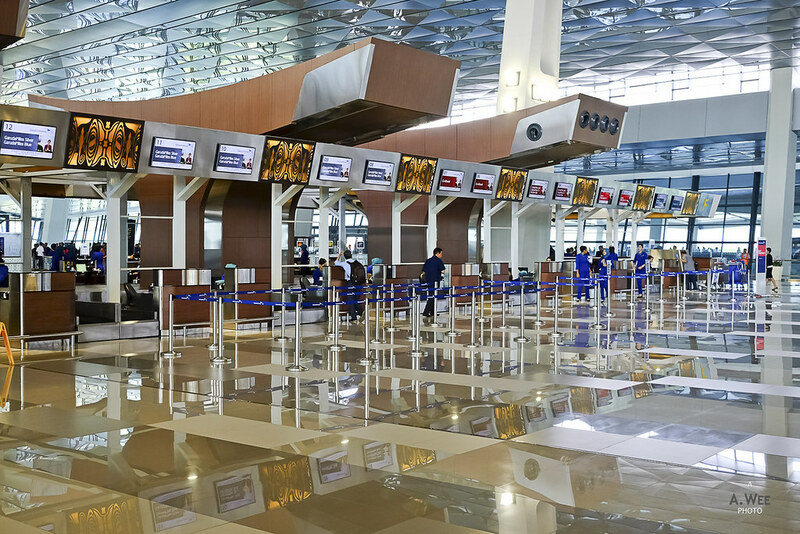 However there are some issues that could make frequent travellers get frustrated such as lack of clear departure information and lack of visibility. 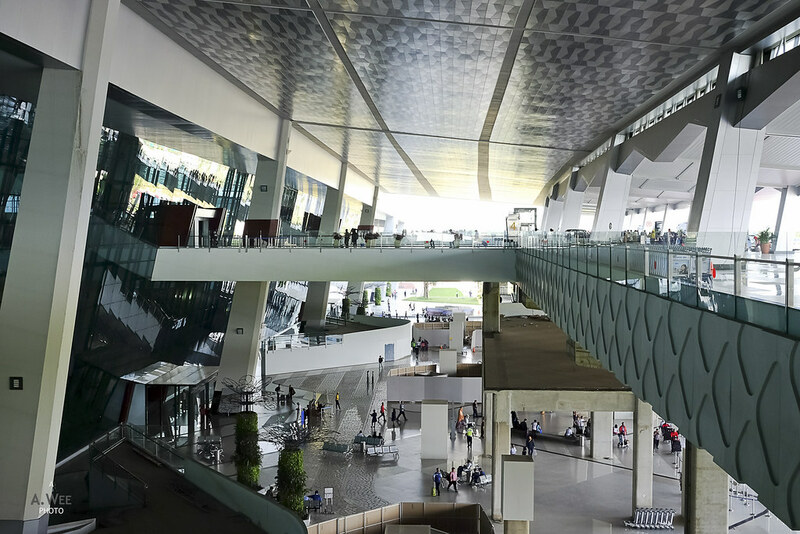 I get the idea of the airport authorities wanting to create a grand space but sadly, it fails in the basics, and with that I seriously doubt it can pose any hard challenge to the established airports like Singapore’s Changi or Hong Kong International Airport at all. Looks like it is yet another wasted opportunity for Indonesia!